Why would a street have a 5 MPH speed limit? The city will temporarily close the "Crookedest Street in The World." 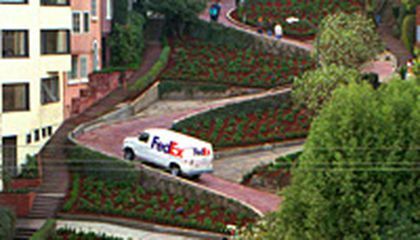 That's a stretch of Lombard Street, a popular tourist spot. The closure will be for four weekends starting in late June. The closure does not apply to residents who live in the area. Lombard Street is a world famous street in San Francisco's Russian Hill neighborhood. It's been featured on TV, in movies and even video games. It is known for a one-block stretch of winding brick road that consists of eight sharp, hairpin turns. The street attracts hundreds of thousands of tourists each year. They like to take snapshot panoramic views of the city at the top. Then they drive down the crooked street like it's an amusement park ride. The temporary closing idea came after complaints by some residents. They want to curb the street's chronic gridlock mostly due to curious tourists, especially during the summer. "This will be a test to improve the safety for residents, pedestrians and motorists in the area," transportation spokesman Paul Rose said. The city will evaluate what impact the temporary closure will have. It may seek to shut down Lombard Street more often, Rose said. No permanent shutdown is being considered yet. Critical thinking challenge: Why do residents of Lombard Street want it closed? How does the city benefit by keeping it open? Which is more important? The residents want Lombard Street closed because there are curious tourists and the residents feel that they need to improve their safety. The city benefits by keeping it open, it can bring the city more money and fame. I think they should maybe try out the test and see how the tourist respond to them temporarily closing a popular tourist spot. The city will temporarily close the "Crookedest Street in The World." That's a stretch of Lombard Street, a popular tourist spot.The closure will be for four weekends starting in late June. 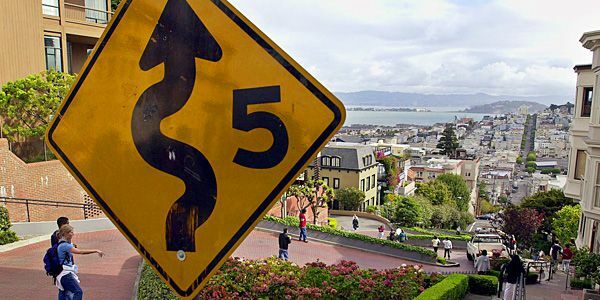 The closure does not apply to residents who live in the area.Lombard Street is a world famous street in San Francisco's Russian Hill neighborhood. It's been featured on TV, in movies and even video games. It is known for a one-block stretch of winding brick road that consists of eight sharp, hairpin turns. I think going five miles per hour is too slow for a street. It does not matter how strange the street is, you should let the people go a little faster than that. i think they should not close the street because what would they do with the space. also if they did do something with it it would cost a lot of money. I think they should hsave go carts on it. This is crazy that they have a street at 5 miles per hour, if they do paint it residents wouldn't get groceries unless they have a different street. The chronic gridlock curb would improve the safety in the street, especially the tourists. I would like to ride down that road on a bike. I enjoy hills but I would exceed 5 miles per hour. it would be fun to ride down that hill. This article is about how the famous Lombard Street in San Francisco will be temporarily closing in late June for four weekends. Lombard Street is known as the "Crookedest Street in the World." Lombard Street is very well known. It is a one block stretch of winding brick road that consists of eight sharp turns. The idea of temporarily closing Lombard Street came from nearby residents . They want to curb the street's chronic gridlock mostly due to curious tourists. Paul Rose, a spokesman, says that no talk of permanently shutting down Lombard Street has been mentioned. I think that the temporary shutting down of Lombard Street is good, as it will give nearby residents a break from the chaos. However, I don't think it should be permanently shut down, as it attracts many tourists. I think that road is very bad and col at the same time because it is wiggly and it can follow a weird path down the way of the road. I think that this road can be really dangerous because cars can get easily crashed in this type of road. I hope that they fix the road because the road will be bad for cars to drive in and that can be a real problem. I think that these road are cool but they can be really stupid. I think that they are stupid because they can cause real bad things and who may know, it might be you the next time you go down the road, you may get hit by another car.